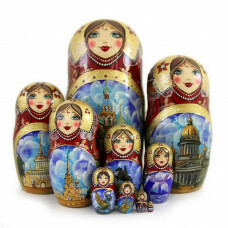 Russian nesting doll or Matryoshka as it is sounds in Russian - is, probably, the most popular Russian national souvenir. It seems, that Matroyshka nesting doll has come from gray-haired antiquity, from the world of legends and fairy tales. But actually this wooden doll is about hundred years old. The wide fame was won by Russian matryoshka far abroad; Now under the assistance of our professional master you have a chance to create your own unqiue souvenir!